The new and elegant Chris Craft 34 Launch has arrived at Marbella! When you board the Launch 34 you immediately know this is not just “any” bowrider. Surrounded by the classic design and impeccable detailing, it invites you to settle in, collect your thoughts and make unforgettable memories with the entire family. 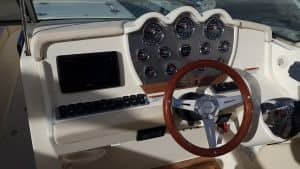 With capacity for 12 people, highly specked and equipped with twin 6.2L Mercruiser 350hp engines, this boat meets the expectations of the most demanding families. 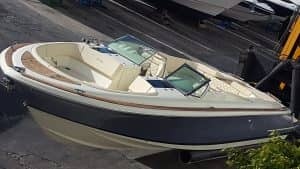 Key highlights include its elegant and sporty lines, its spacious aft sunpad, and the sociable seating layouts both in the cockpit and bow, which encourage conversation. 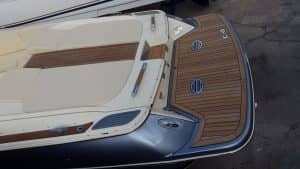 A marine vinyl upholstery in almond color contrasts with the teak, and reinforces that touch of distinction and style, so characteristic of this prestigious shipyard.